From days of long ago. From uncharted regions of the internet, comes a legend. The legend of Albegas (or Arbegas and a few other translations), defender of the universe! A mighty robot, loved by World Events, unknown to the fanbase. As Voltron’s legend grew, peace settled across the airwaves. In the United States a fandom was formed. Together with the good kids of the neighborhood they maintained peace throughout afterschool TV time. Until a new, unfamiliar robot threatened the franchise…but I exaggerate. The Voltron they knew was needed once more. This is the story of a forgotten force of space explorers. Specially selected but denied by fate to fully become…Voltron, defender of the universe! Lightspeed Electroid Albegas was a 45 episode series airing in Japan in 1983. The show was also released in Latin America, Spain, Italy, and I found an Arabic translation on YouTube as well. It was the show World Events Productions picked to join their “Voltron Trilogy” as Voltron II, protector of the “middle universe”, and I don’t know how you calculate that in one, infinite universe. Matchbox released a toy of it alongside the Vehicle and Lion Voltrons (I and III respectively) of the near and far universe. (Cue Grover from Sesame Street). My friend Tim had the toy and while it was neat we couldn’t figure it out, probably because the show it came from never aired in the US. We wouldn’t know that until years later thanks to the internet of course. Albegas was set on Earth, which obviously WEP would move to another planet. The show followed three young people, as giant robot shows tend to do, who piloted three robots–Alpha, Beta, and Gamma (named after the first three letters of the Greek alphabet). Each had a ship that could combine into a fighter jet, although this was replaced with three ships that turned into robots that combined into Super Abega. They used these ships to enter their respective “droids”. Daisaku Enjoji piloted Alpha Robo, the black robot, Tetsuya Jin piloted Beta Robo, the blue robot, and the lone female, Hotaru Mizuki, piloted the red Gamma Robo. When the Derinja race came to Earth to add it to their empire, the three robots got their tails kicked by the enemy’s “Mecha-Fighters” (their version of the RoBeast) and are rebuilt to combine into Albegas. They also had another fellow student who created his own goofier robot who always got into trouble. Kind of like Boss Borot/Bobobot in Mazinger Z/Tranzor Z. Unlike the other would-be Voltrons the “Gladiator Force” (not an official name but one the Voltron fan wiki dubbed them, because of course there’s a fan wiki) doesn’t have one set form Albegas could take. Based on which robot formed the head, center, and lower parts of Albegas, the robot had different abilities and weapons. The default set is Alpha on top, Beta, in the middle, and Gamma on the bottom and I will delete the daylights out of any dirty jokes in the comments. This is a clean site, people, but I know you, internet. Oh, I know you too well. Anyway, this was the basic fighting mode and where Albegas used his version of the Blazing Sword. If Alpha took the bottom and Beta the top it would better fight underwater. There were six combinations in all. It’s similar to another giant combining robot show who did make it stateside in one form or another so you may have heard of it; it was called Getter Robo. The Derinja, hailing from the planet Deram, are purple-skinned aliens, which must have been a popular alien color in anime at the time. Of course this does allow them to fit in with the “Drule Empire” part since both DaiRugger and GoLion featured purple-skinned aliens that Voltron combined into one race, Zarkon simply being in charge of the far universe. President Azass led the forces with Generalissimo Duston until they were replaced partway through the series. They also ran a conquering empire, so they would have fit right in with the Drules. All of this sounds really cool. So why didn’t Albegas get to join DaiRugger and GoLion as Voltrons? That’s kind of DaiRugger’s fault. Instead of the Voltron Trilogy opening above (considering it’s still up) we got the more classic intro we 80s kids know and love, which made no mention of other Voltrons. They also went with Voltron III first instead of last as the name would imply, so the Lion Force was the kids first exposure to Voltron. And we loved it! It had action, it had romance, it had a giant robot fighting giant monsters and a strong mythos behind it…what wasn’t to love? So when the Vehicle Force made their appearance kids were confused. The show wasn’t as action packed, as the focus was primarily on peaceful exploration. It was basically Star Trek without the morality plays. And kids didn’t get into it the way they had the Lion Force, not aided by the lack of a strong connection. I keep bringing up Robotech but they got the formula right while Voltron failed to connect all of the dots. And since Albegas didn’t do well in Japan despite appearing in other countries, World Events opted for the self-produced season, going back to the Lions their young fans had been so drawn to. Albegas just…wasn’t needed any more. There was an attempt to tap into the series anyway, just not by World Events. Sega was planning to release a laserdisc arcade game–you know, like Dragon’s Lair–starring Albegas under the name Cybernaut. The regular Wikipedia says the game was never released. This show just can’t get a break, can it? While we have no official idea of what a Gladiator Voltron would have been like, we can sure speculate. If it were me, this would of course be a not-Earth planet somewhere in the middle universe. The Drules finally decide to make a link between their two empires in the near and far universes, with not-Earth the staging ground of Drule invasion. Three young cadets of Galaxy Garrison would be training on this planet when they invade but their robots would be no match. The girl happens to be the daughter of a famous scientist and the one who rebuilt the robots, but I’d probably have him be one of the scientists who helped create Vehicle Voltron, and would apply that knowledge to make a new Voltron to protect them from the Drule incursion into their universe. But what World Events would have done we may never know. But this isn’t the only robot who failed to make it as Voltron. There’s more Wertham next week so in two weeks I’ll introduce you to one more robot that I stumbled across researching this one. If Albegas is the Voltron that wasn’t, this one is the Voltron that should have been, if someone hadn’t goofed. Would he have made the same splash as GoLion? I have some more research to do and then we’ll find out together. Posted by ShadowWing Tronix on August 30, 2017 in Animation Spotlight, Television Spotlight and tagged anime, Lightspeed Electroid Albegas, Voltron Gladiator Force, Voltron II, Voltron: Defender Of The Universe, World Events Productions. I wonder if Tim still has his Albegas Voltron toy from Matchbox? Seeing those Albegas toys on the boxing for the Matchbox Vehicle Voltron toy I had did peak my curiosity. As a kid, I wanted to learn more about those robots. I also wondered if a cartoon featuring them would someday appear. Now I know the full story of why that never happened. Even so, I think that 80s kids would have liked an Albegas Voltron show. The way you described how such a show could have been does sound appealing. Maybe someday we will get our Albegas Voltron show that we never had as kids. Or perhaps, a comic book will be produced about it in the future. Never say never. Great article. 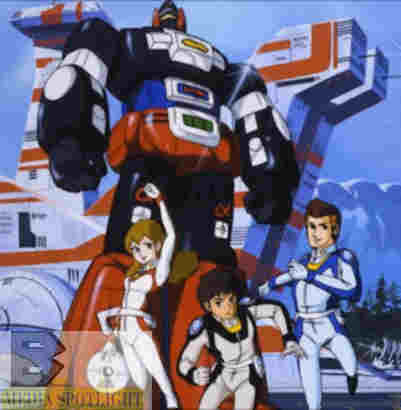 Luckily i am a native arabic speaker and watched this show as a kid and found the whole thing on youtube and I honestly dont unders Why it never made it as big as GoLion (which is simply called Voltron here). I hope we see 70s & 80s mecha animes make a comeback. Its the stuff i grew up on, besides TMNT & Captain Planet but those are western shows. Here in the US we did get some Japanese shows on their own, but during the 80s both Voltron and Robotech were made out of multiple shows forced into a shared series to pad out their episode count compared to Japanese TV. (Also a show called Macron-1 but it was worse at it than Voltron was.) Robotech was the only one to do this right, while one other show did the next best thing (and possibly better idea) of creating an anthology of a number of giant robot anime. As I said in the article the way World Events edited Voltron they started with the lions and then the vehicles but never gave an in-story reason why two robots shared the name, so US kids got confuses, and Voltron was easier to get into with the smaller cast. Kids weren’t interested in the “vehicle Voltron” like they were the lions and they opted not to even try working Albegas into their Voltron. I don’t think any other country tried to combine shows like this, so they got these shows with their proper names, just translated into their language. Nowadays that’s how US distributors do it as well. Nobody’s trying to put Pokemon and Digimon under the same name and universe for example.